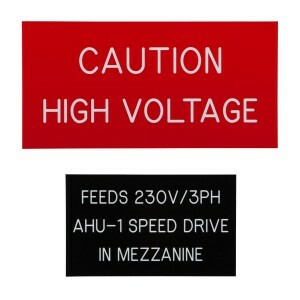 Customized phenolic signs are needed for many industrial applications. to name a few uses. It’s easy to buy pre-made plastic signs, but what do you do if you need a custom sign, such as a phenolic sign, specific to your situation and application? Never fear, we are here to help! Trophies2Go can craft a plastic or metal sign to your exact specifications. We offer plastic in a range of colors for both indoor and outdoor use. In aluminum & brass, we offer metal signs in your choice of gold, silver, black and other colors as well. We can engrave both plastic and metal signs with text in any language you like. And your sign can be cut to whatever size you need for your application. They are fully customizable to your need! Are you applying your sign to a wall? Machinery? A door? Application matters - and we provide a number of different options. We offer engraved signs without any backing material, with double stick tape, with velcro or with magnetic strips. Or maybe you need to screw the sign into something - if so, you can request two small holes on either side of the sign or all four corners. If you choose an option with holes, matching screws are included. Call us at 877-926-4700 for questions about signs. Whatever you need for your specific project, we will make an engraved sign for you at an affordable price. Our phenolic signs, industrial signs, safety signs, and business signs are designed and etched in-house. Get a proof of your text before it gets engraved - FREE for orders over $50. Production time on both plastic and metal signs is fast, usually 1 business day. Find out more by browsing our Industrial Signs category or giving our friendly and knowledgeable customer service team a call at 877-926-4700.